In the last few months I have read two books about Iran and the impact of the 1979 revolution. 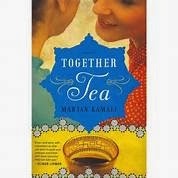 Together Tea is a fantastic book in so many ways. It is the beautiful story of a mother and daughter. It shares the immigrant's view of America and the grandeur of the home country. It is the story of growing up and growing old and although I have never been outside the United States, it somehow is my story too. Marjan Kamali's work of historical fiction begins in America in 1996 when 25 year old Mina is pursuing Business School at Columbia. Her mother, Darya is intent on finding her a Persian husband. Mina's family came to America in the early1980s from Iran. The revolution made her parents seek freedom for their family in the US. I was born just a couple years before the Mina. So I lived as a twenty something during the 1990s. But now I am forty something, or approximately the age of the mother, Darya. And so each page I read as a young woman Mina, and now as a mother, like Darya with two daughters of my own. I totally identified with Mina's youth and dreams for her life. I understood how her mother could make her crazy, but then in the very next chapter, I felt myself as Darya wanting so much for my daughters and going to any length to help them achieve, or receive what I think they should be/have. Throughout the entire book is the memory of Darya's mother Mamani. Mamani was killed by a bomb in Iran in 1979 when she was probably in her 60s. I too lost my mother in her 60s and her hopes and dreams, her labors and sacrifices have greatly formed all the that I am. Just as Darya and Mina both consistently felt the loss of their mother and grandmother, I too have missed my own mother and never stop thinking of her. It was eye opening to learn more about Iran, a country I only know as a land of terrorists and Saddam Hussein. The book is perfect for an arm-chair traveler to take in Tehran, the parks, the street vendors, the Persepolis, the food and so much of the history and beauty of a far away country. I really learned how much their people have suffered and saw the hope that lives in every heart of man. I particularly enjoyed Together Tea since I had recently read Persepolis. I got interested in Persepolis, when my son brought it home as his high school assignment. Persepolis also is about a girl just a little younger than me. As in Together Tea, Persepolis is the autobiographical work of Marjean Satrapi who was also born in Iran. She did not get to leave Iran with her family as Mina did. In Persepolis, Marji's parents sent her away alone to boarding school shortly after the overthrow of the Shah in 1979. Persepolis is a graphic novel (comic book style) and the images really made the story come alive. Both of these books tell of coming of age in the midst of war and revolution. Marji, unfortunately fell into many of the pitfalls of youth away from her parents. My heart broke for her as she learned so many growing up lessons the hard way. Most interesting to me was how the characters in both books live in a world without faith. Mamani was a devout Muslim, who prayed regularly, but Darya and Mina never practiced their faith. Marji has a section about praying to God in Persepolis but he is as grandfather in the sky, who can't or won't impact her life. Always on the look out for ways to increase and improve my prayer life, I am delighted to find the free Laudate App. At last something I really want to listen to early in the morning when its dark and I am out walking before the days begins. I've had an iphone for a while, but didn't really want to listen to music on it and didn't know how the apps could work. So I am happy to share my new routine. 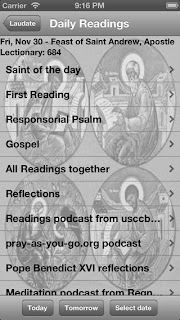 I start with "readings podcast from USCCB" and listen to the first reading, responsorial psalm and gospel for that day's mass. Then I go to the "pray as you go podcast." This starts with bells ringing calling us to prayer, followed by a hymn. Then a meditation is lead that concerns the mass readings and leaves periods of silence to think over the point made or the question asked. 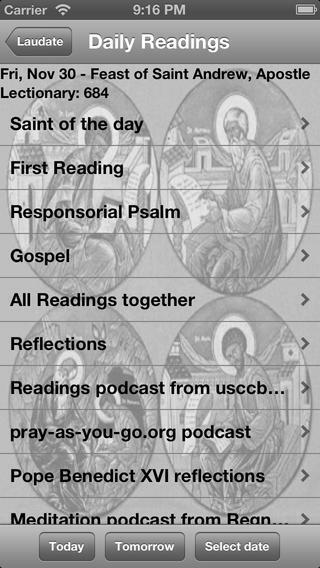 This app allows you to select the date you'd like to hear, so if it is a Saturday, I will often select the Sunday readings to prepare for the next day. I have also enjoyed the "Pope Benedict reflections" by Leonardo Defilippis, of St. Luke Productions. I have to say that Pope Benedict's writings are advanced. 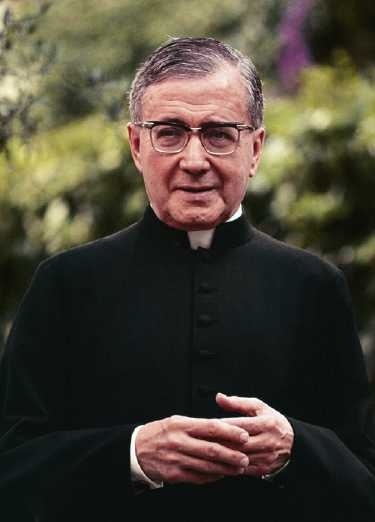 But listening to them dramatically read by Defilippis helps me understand the important writings of our Holy Father Emeritus. 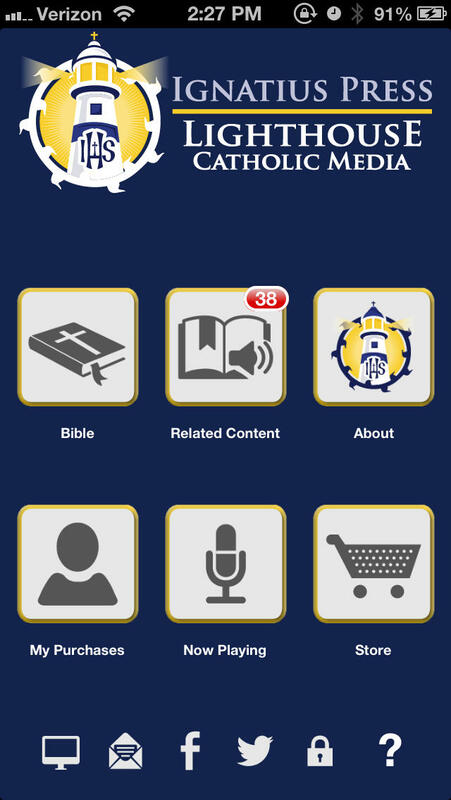 Then, if I have more than 30 minutes, I LOVE to turn on my Ignatius Press/Lighthouse Catholic Media bible App. The app is free so that you can read the entire bible, but I must say, the $20 I paid to "hear" all of the new testament dramatically read (Truth and Life Bible project) was well worth it. The app also is a portal to all the great talks by Lighthouse. There are several for free and then all the others can be purchased for a small charge. To get the free talk, click on the icon that looks like a lock at the bottom right of the home screen. 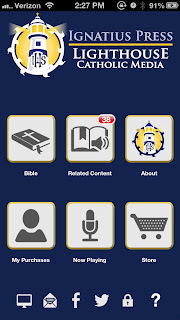 Enter promo code 1380 and it will let you choose a free talk from Fr. 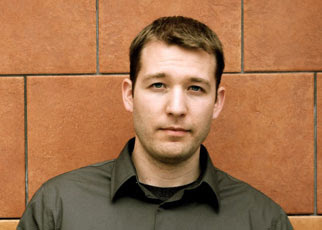 Michael Schmitz or Dr. Scott Hahn. I know there are many more apps out there just waiting to be discovered. If you've found a good one to help walk and pray, let me know! I am so excited to share with you these fictional novels with pro-life messages. I think there is a real power to a story with real life characters to help better understand all the aspects of being pro-life. 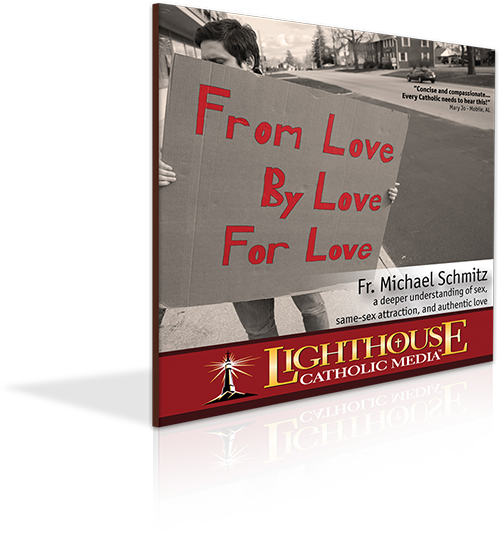 These books specifically cover the issues of contraception, natural family planning (NFP), abortion, sterilization, divorce, unplanned pregnancy, infertility and invitro fertilization (IVF) all from a Catholic world view. What makes them so powerful is the characters are people just like us--people who live in our culture and are constantly bombarded with the message of the secular world. I really, really enjoyed this short novel about a young college girl, Rachel, facing an unplanned pregnancy. The author successfully uses story telling to convey so many truths about a woman's "choice" and the influences surrounding her in America today. Written from a Catholic world view, Gladu incorporates the powers and principalities, not seen, that are very real and present when life and death decisions are being made. These angles and devils take form as humans and interact with Rachel in the story. His portrayal of the abortion industry is very eye opening. Challenged with incompetent staff, whack doctors and owners who's only goal is to make money, he paints a picture of the reality of these centers who are not truly interesting in helping women in crisis. A very striking part of the novel to me is part that the communion of saints plays in our lives. Gladu beautiful describes the soul of Rachel's grandmother being forgiven of her past sins and then interceding for her family members from heaven. I could hardly see the words on the page as tears of joy filled my eyes. I think this book will motivate many to see the battle for Life as a very important struggle that we all need to be involved in. It will encourage those already working at pregnancy centers and walking the picket lines outside abortion clinics. It will, please God, transform the hearts of the those women in troubled or unexpected pregnancies to see the bigger vision of the amazing plan God has for their life and the life of their unborn child. This is a book everyone needs to read and share! Just a year ago, Kari Burke published her first novel, The Life I Dreamed. At that time I wrote "I really enjoyed Kari Burke's novel of a 30 something married couple with 4 young children. Burke's descriptions are so realistic and poignant. She shares the daily struggle but is able to let the reader see the joy that comes from being faithful to one's call to marriage and family life. This is a super pro-life story. In our culture with all the noise of which side is right and wrong, this story shows how one family's actions quietly done speaks loudly." CLICK HERE for complete review. This past winter and spring, my husband Bob and I both tore through all three of these thick novels by Brian Gail. They were all three books that I literally shirked all my household duties to read. Gail uses wonderful real-to-life characters whose stories cover the end of the twentieth century into the present time and then into the future. As these real people struggle with "making it" in America, family relationships, friendships, and faith questions, the reader feels like Maggie, Joe, Fr. Sweeney, and Michael are actual people we know and love. About Fatherless: An intensely human tour of the great spiritual battles in the US Catholic church during the late 20th century. Brian Gail takes us out into the “trenches” and shows what life was like for Catholics during this critical time. Meticulously researched, brilliantly crafted, Fatherless takes the reader on an unforgettable journey inside Fortune 500 boardrooms and Madison Avenue screening rooms, behind one-way mirrors in America’s heartland and two-way screens in church confessionals, to the very peak of Ireland’s highest mountain and inside the papal dining room of John Paul II in Rome. Motherless takes the reader on a riveting behind-the-scenes journey around the globe to the boardrooms and laboratories where the architects of The Life Sciences Revolution are preparing Mankind’s Final Solution… and into the confessionals and chanceries where the Church’s response is being challenged. About Childless: The reader is propelled from Manhattan boardrooms to European capitals to Middle East laboratories to Church chanceries and confessionals. Step into these pages and follow Fr. John Sweeney and the families he serves as they struggle to live their Catholic faith in a world that grows more hostile with every turn of the page. Gail throws back the veil on the architecture of the Life Sciences Revolution and its carefully planned milestones—from the abortifacients pill to in-vitro fertilization to embryonic stem cell testing, and ultimately, to the very door of the Transhumanist project itself. Great talk by one of the foremost abortionists in the USA and how did a 180 degree turn, became a Catholic and did all he could to help the prolife movement. Click HERE to hear the amazing talk by Dr. Bernard Nathanson, available on CD or MP3. 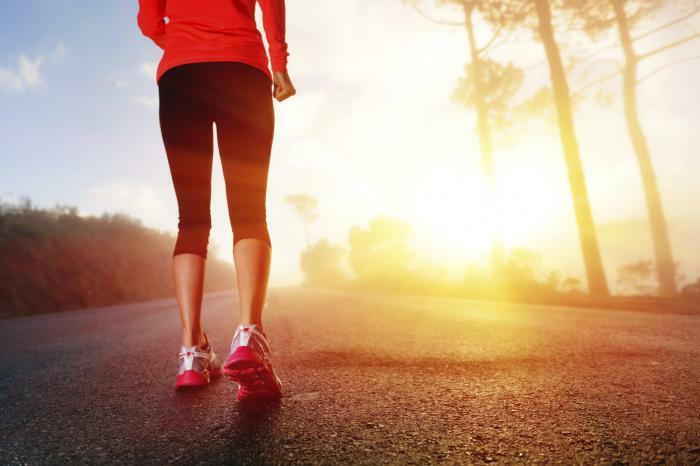 One of the things I love best about Summer is that we are "off the treadmill." During the school year, in addition to homework and dinner and bath and bedtime routines, we also have multiply sports, music lessons, alter serving, choir, jobs and clubs! While dinner together as a family is a priority, it can be hard. But summer time opens up the evenings for us to eat together more regularly and pray together more regularly. Below are some great ideas and quotes from the book My Brother the Pope. My Brother the Pope was written by Msgr. 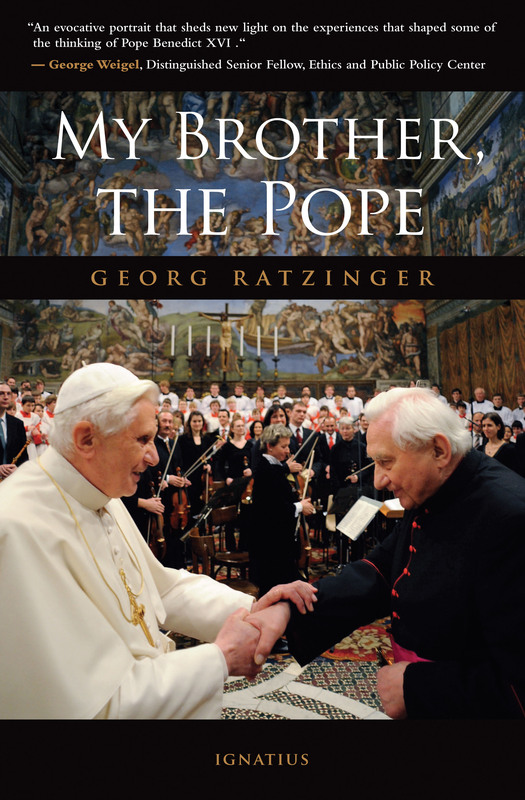 Georg Ratzinger, brother of Pope Emeritus Benedict XVI . In the book, Msgr. Ratzinger shares some the things their parents did that developed a loving Catholic home and helped spark the priestly vocations of both of their sons. During this time of year when it is so hot outside, it is great to make meals that require little or no cooking, especially salads and sandwiches. Use fresh summer ingredients like Watermelon, Corn,Tomatoes, Cucumbers, Eggplant, Peas, Green Beans, Okra, Peppers and Zucchini. There are so many great recipes that use all these that are freshest in the summer months. 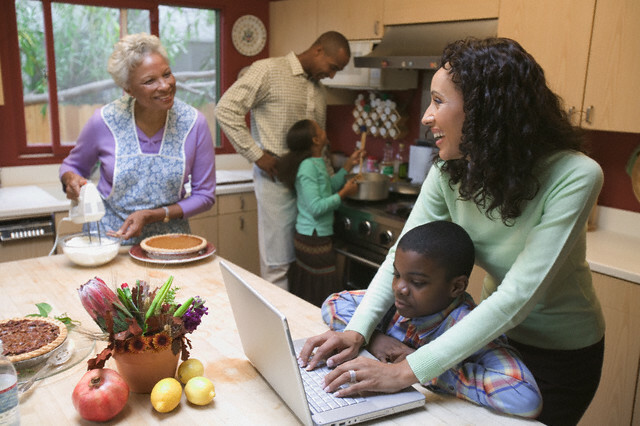 Ask the older children to give you a hand by looking up recipes on line, helping to shop and doing simple prep things like cutting vegetables. Working together as a family is fun and makes great memories. Be sure to say prayers at every meal both round the dinner table at home or when eating out. 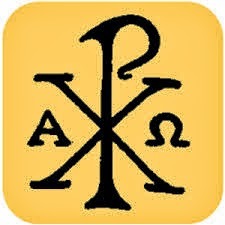 "Bless us O Lord and these, thy gifts, which we are about to receive from they bounty, through Christ our Lord, Amen." "We give Thee thanks for all Thy benefits, O Almighty God, who livest and reignest world without end, Amen." Ask all the family members to help clean the kitchen after dinner. Divide the jobs up (clearing the table, loading the dishwasher, hand washing pots and pans and sweeping the floor.) Sing a Marian hymn or any kind of praise and worship song, and if you aren't a good singer, play great Christian music. Many of us have tried in the past to get the family together regularly to pray the rosary. One thing that can help bring success to this practice include setting a regular day and time, even putting it on the calendar so you make it happen. Once you get the habit going, it will be easier. If the children are really young, start with just a decade and don't get worried if they are fidgety. 5. Celebrate the Saints feasts days for each person names and invoke the Holy Family to intercede for your family. Just as you might already do for birthdays, make a special dinner for each person's Name Day. The Name day is simply the feast day of the Saint for whom you are named. You can just do first names or if you really like to celebrate, add the middle names too. CLICK HERE for a list of feast days by name. 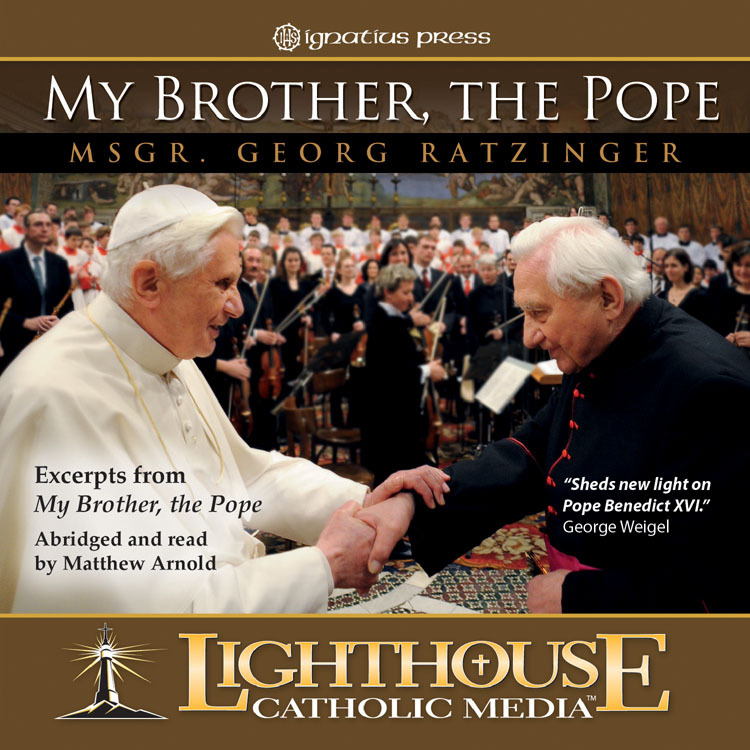 Want to get more ideas for your family and learn more about the Ratzinger Family? Excerpts from the books are read on this one hour presentation via CD or MP3, CLICK HERE to order. Hey catechism fans - I'm both saddened and energized. I'm saddened because recently, as you probably know, the cause for Marriage has taken some blows. But what saddens me most about it is that we could have done more to stop it. The Church gives us beautiful answers and meaningful explanations for the truth about Marriage. But we have been ineffective at articulating them to our peers and at inspiring our children to embrace them (which is understandable - it's hard to do!). I'm energized because it doesn't have to be *that* hard. This crisis is a huge opportunity. But we have to be able to share the genius and beauty of true marriage. And at the same time, we have to make sure that every person, no matter their struggles (homosexual, heterosexual, whatever), knows they belong in the Catholic Church. That God loves them and that the truth about Marriage and sexuality is what will set them free to be who they were made to be. If we can't explain this convincingly, we need to learn how. Here is a phenomenal talk (CD or MP3) by Fr. Mike Schmitz on just this topic. Listen to it 10 times. Give it to your friends, family and children to do the same. Let's jump into the public discussion energized and equipped to change hearts. Click here for a 10 minute preview of the talk or to get it now ! "If you struggle with defending the Catholic Church's stance on the issue, this is the talk for you!" fort•night (ˈfɔrtˌnaɪt, -nɪt) n. a period of fourteen nights and days; two weeks. 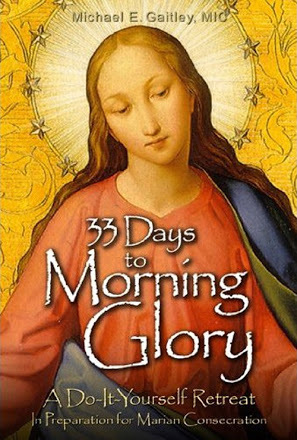 The Bishops in the United States have asked Catholics to join them in fourteen days of prayer starting on June 21 (the eve of the Feast of Sts. Thomas More and John Fisher and leading up to Independence Day on July 4. Here are seven ways you can participate in this Fortnight for Freedom. Make a sacrifice. Give up something. Fast. St. Thomas More gave up his life. We can willfully give up one of our comforts in hope that God will use this sacrifice to protect our liberties. #3 Ask you pastor to preach on religious liberty. You can donate to the Becket Fund, Thomas More Society, Alliance Defending Freedom, Thomas More Law Center, The American Center for Law and Justice, The Freedom of Conscience Defense Fund, and of course the CatholicVote.org Legal Defense Fund. In St. Mark’s gospel chapter 6:7-13 Jesus sent out the Twelve on mission. They were sent out two by two and Jesus gave them authority over unclean spirits. They went off and preached repentance. They drove out demons and anointed with oil many who were sick and cured them. 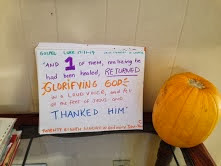 When the twelve returned, (beginning in Mark 6:30) they reported all they had done and taught. Evidently their missions had had success as “people were coming and going in great numbers and they had no opportunity even to eat (Mk 6:31. )” Jesus is well aware of the hard work they have done and knows too their need to replenish their spirits and bodies so they can continue to minister, and so He invites them to come away. During the summertime, many families plan vacations. Some vacations are to far away places or to extravagant resorts. Other vacations are more like “stay-cations” where the family stays close to home but tries to do some fun things that are easy on the budget. It is important when planning summer activities and vacations to make sure we focus on recuperation, renewal and rest. If you’ve ever been on a certain type of vacation where you come home more tired than when you left, you know what I mean. In her book The Appalling Strangeness of the Mercy of God, Ruth Pakaluk shares beautiful thoughts on summer and recreation. Everyone seems to relish the long days of Summer and Summer is a great time to take a vacation-but DON’T take a vacation from your faith! One of the things I love about being Catholic is that the Catholic Church is everywhere, universal. Summer is a great time to live this message deeply and teach it to our children. 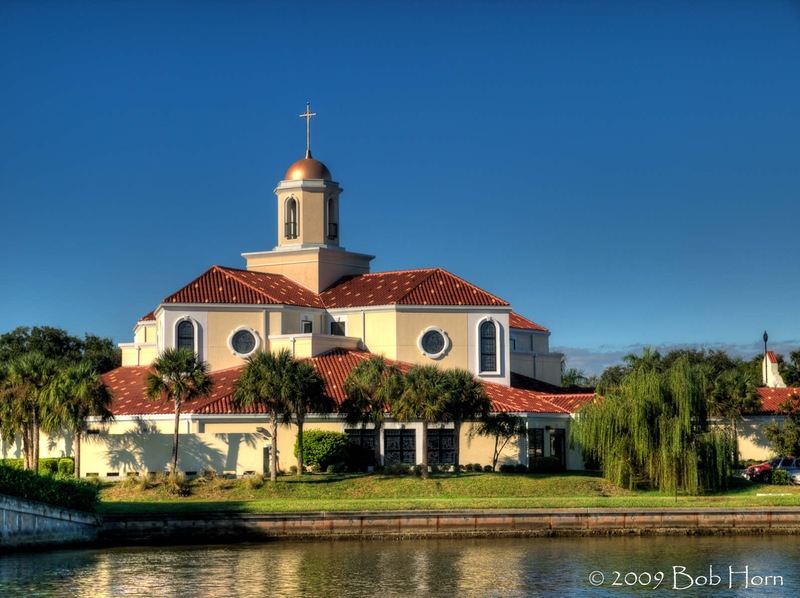 If you are planning to go away this summer, be it across town, or far away, the first thing you need to do is plan where you will attend mass for the Sundays you are away. Technology has made this so quick and easy. We can all do it with just a few clicks of the mouse. 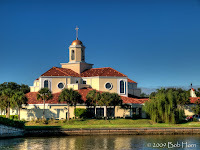 You can find Catholic Churches and mass times for any parish by city name, zip code or area code at www.masstimes.org. Or on a Google map put in “catholic churches” and the name of the city and it will pin point all the surrounding parishes. Keeping Holy the Sabbath during summer is the best way to rest regularly. When we attend mass each Sunday, we take all our work and efforts from the week and lay it on the altar to be offered up to God the Father along with the sacrifice of Jesus. Live this summer with all the sacraments and grace you can get! Due to the partnership, I had the great pleasure of making a pilgrimage to the Divine Mercy Shrine in Stockbridge, MA last month. It was a singular, unexpected privilege to spend three days there, make a retreat with Fr. Michael Gaitley, pray the life size Stations of the Cross and tour the facilities of the Association of Marian Helpers. Since going to the shrine and learning more about the message, I have gotten a copy of St. Faustina's Diary. I was a little "afraid" of it at first. I thought maybe I wouldn't be able to understand it, but I am really enjoying it and it is clearly written and easy to follow. 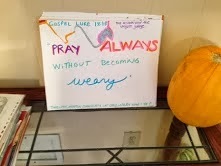 I am very challenged by her life and the words of Our Lord recorded by her. 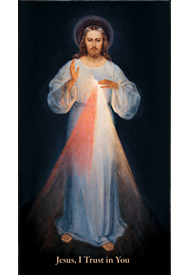 The Divine Mercy Message is one that needs to go out to the whole world. Along with reading the Diary, I am also reading the authorized biography of St. Faustina, titled The Life of Faustina Kowalska by Sr. Sophia Michalenko CMGT. This is an easy to read biography which has many quotes taken from the Diary. The advantage is that it is written in chronological order. Both of these books have been ideal reading during adoration. Join me in reading this over the summer! . The Divine Mercy Image is now be printed on canvas by the Association of Marian Helpers. Click here to get one for your home or office. An old Catholic tradition that dates back to the Middle Ages is making a comeback: the Mary Garden. 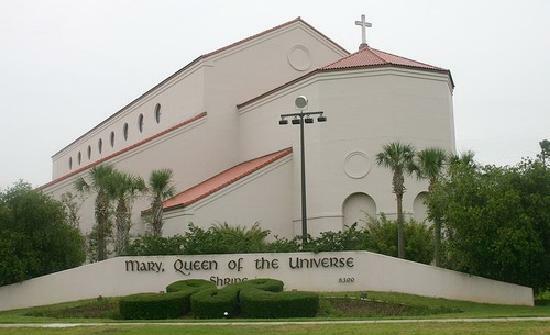 By definition, a Mary Garden is one that is dedicated to Our Blessed Mother. Centuries ago, at a time when books were scarce and many were not able to read, a Mary Garden was another way to teach others about the life of the Blessed Virgin and her virtues. St. Benedict is said to have had a monastic rose garden or "Rosary" in the 4th century but the first reference to an actual garden planted in Mary's honor comes from St. Fiacre, the Irish saint of the 7th century who is the patron saint of gardeners and gardening. A statue of Our Lady is present in most Mary Gardens and the flowers chosen are those that have been associated with the Blessed Mother either by name, symbol or legend. Roses: Roses have long been associated with Mary. They are considered to be thequeen of all flowers and, therefore, remind us of Mary as Queen of the Universe. Violets: Violets are considered a symbol of Mary's humility and innocence. represent the sword of sorrow that pierced Mary's heart. Lillies: Lillies' white color and sweet fragrance symbolize Mary's purity and loving obedience to God. Lavender: This fragrant herb is also known as "Our Lady's drying herb" because of the legends that Mary hung the Christ Child's blanket on a lavender bush to dry after washing.